Buy Real Marketing claims to offer an all-in-one social media solution that provides active followers and high-quality engagement. According to them, their customers trust them for their credibility, turnaround time, money-back guarantee, and exclusive customer support. The company has a range of services for Facebook, including likes, shares, reacts, check-ins, and video views. For Facebook likes, they have seven packages starting at 250 likes up to 10,000 likes, which aren’t big enough compared with what other top-rated providers offer. Their services are more expensive, too. On closer look, we found out that the likes they provide are from inactive users. Buy Real Marketing’s turnaround time is also slower than most providers’. In addition, the duration of their retention policy is shorter than what others have. Overall, we do not recommend Buy Real Marketing as a credible company. For better services at great prices, check out our top five Facebook likes providers. 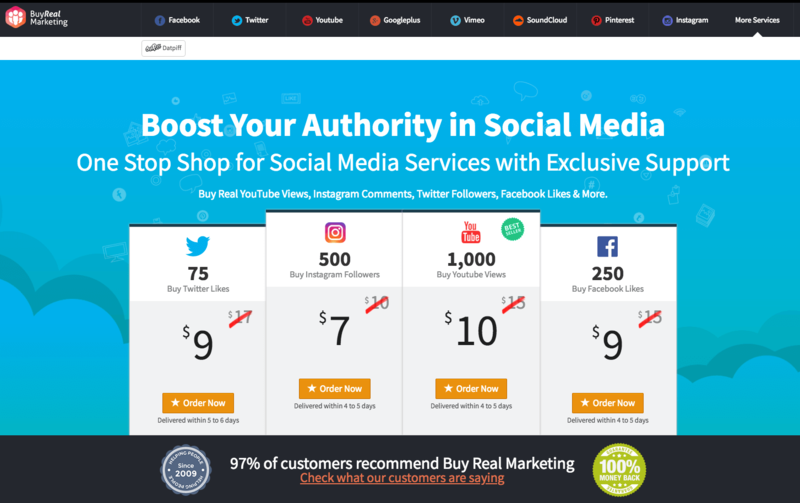 Established in 2009, Buy Real Marketing is a social media promotions company that caters to some of the biggest networks, including Facebook, Twitter, YouTube, and Instagram. They offer money-back guarantee, exclusive customer service, and fast delivery. For Facebook, Buy Real Marketing provides a full suite of engagement and growth services, including likes, shares, five-star rating, and video views. Their Facebook Likes packages suit small-scale to medium-scale growth, with their biggest package providing 10,000 likes. They are not the company for you if you’re looking for explosive growth. They claim to deliver their service between 4 and 21 days, depending on the size of the order. Furthermore, the company offers a 60-day retention warranty to protect you from losing the likes or followers you’ve paid for. Buy Real Marketing offers Facebook Likes packages that could drive conservative growth to your page. Unlike other providers with packages that includes as much as 100,000 likes, their biggest package comes with only 10,000 likes. For a package of 1,000 likes, the company’s price is higher than the industry average, which isn’t very encouraging, considering you would only get inactive users. You could place a one-time order or sign up for a subscription service to get discounts. They accept payments through PayPal, credit cards, and debit cards. The prices listed below are for single payments or one-time orders. At the time of writing, we were informed by their customer support that they are not accepting new orders, as their payment gateways are under maintenance. We reviewed the terms and conditions sections on the Buy Real Marketing website and made a few comments on their status below. To find out more details on these, then please toggle the sections to see what we thought! Buy Real Marketing owns full intellectual property rights to all the materials published on their website. Any information posted must not be used, copied, changed, or distributed without the consent of the company. They reserve the right to refuse service to customers without explanations. When this happens, they shall refund your payment in full. Buy Real Marketing has the right to update, correct, and change any information published on their website. However, they do not guarantee that any errors or inaccuracies will be corrected immediately. Buy Real Marketing only asks for confidential information that allows them to deliver their services and communicate with you. These include your email address and the link to your social profile. Other information sent through the website is considered non-confidential. By using their website, you allow the company to use your information as they see fit. Buy Real Marketing offers 100% money-back guarantee for 30 days from purchase. You could request a refund if the company fails to complete your order within the specified turnaround period. Buy Real Marketing may also provide a refund if they have not started your campaign within 24 to 48 hours upon placing your order. You may also request a refund two to five hours after placing your order. According to the company, they will entertain requests for redeliveries within 60 days. There are no other information provided about their retention policy or how to request for redeliveries. 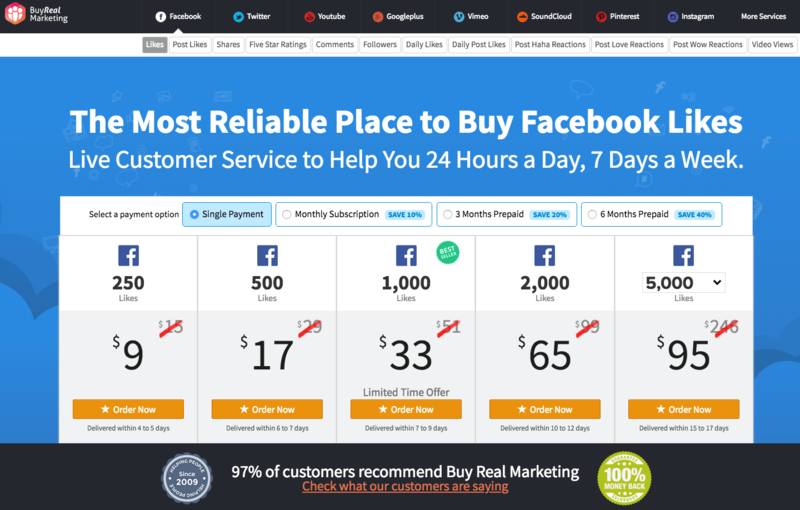 Buy Real Marketing has a live chat support and an FAQ page. In addition, you could reach out to them through their email, hello@buyrealmarketing.com. They also have a link that should direct you to their contact page but it leads to their homepage. It seems that this is a common problem on their website, making us question their overall reliability and credibility. Their customer support replied within 15 hours only to inform us that they are not currently accepting new orders. They did not bother to answer any of our questions. Buy Real Marketing provides small to medium Facebook Likes packages that may not be enough to propel maximum growth for your page. In addition, you will be getting likes from inactive users for a price that’s higher than what other providers offer. Taking all these into consideration, we cannot recommend any of their packages to help you with your social media marketing needs. For more options, go through our list of reliable Facebook likes providers. According to their FAQ page, orders are processed within 24 to 48. Your campaign will start immediately once purchase is confirmed. Turnaround time for their service would depend on the size of your order. They could deliver 250 likes in four to five days. 10,000 likes would take between 19 and 21 days to complete. Based on their FAQ page, Buy Real Marketing provides Facebook Likes from inactive users. Apart from the service that you purchased, you will not get anything more from the likes you’ve bought. This is quite a let down, as they charge more for their packages than most providers. Buy Real Marketing does not provide any information regarding their retention rate. You don’t have to worry about drops, however, as they claim to offer a 60-day retention warranty. If any of your likes drop within this period, they will replace them for you. The company did not mention how you can request refills or redeliveries. 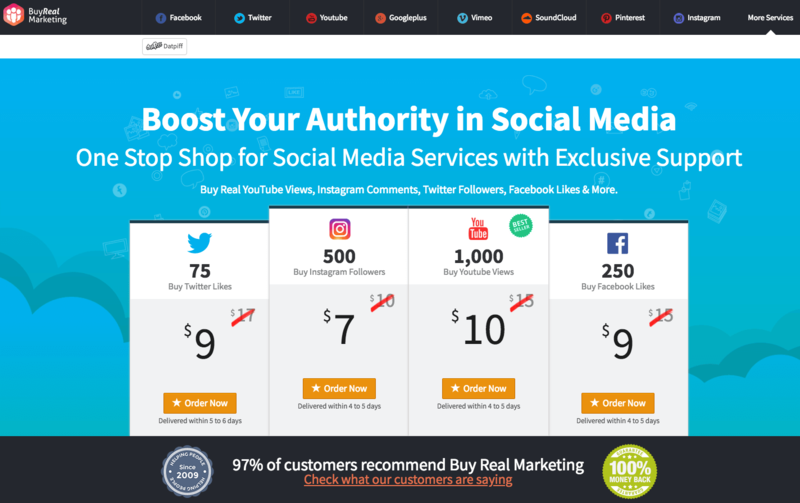 On first look, Buy Real Marketing seems like a promising social media promotions company. A thorough evaluation on their service, however, reveals that they are not the type of provider that they claim to be. Buy Real Marketing offers Facebook likes packages at prices that are higher than the industry average, but does not provide high-quality likes. Their Facebook likes come from inactive users, which won’t do your Facebook page any good. Their retention policy is quite short, covering only 60 days. Their live chat support was rarely online during the duration of our evaluation, giving us no choice but to leave offline messages and wait for them to reply to us via email. This could be a concern if you need immediate assistance. Overall, we do not recommend Buy Real Marketing as a good source of Facebook likes. To get high-quality likes and the best value for your money, check out our list of top-rated Facebook likes provider.